Walter's crimes and especially his break-out attempts were widely reported in some detail in the local and interstate press. INCENDIARISM. DESTRUCTION OF A HUT SMART ARREST. A smart arrest was made this evening by Trooper Shepherd, of Fingal, and Con stable Hogan, of Mathinna, of a man named Walter Redburn, aged about 37 years, who is charged with incendiarisms and robbery. He resided in almost inaccessible heights of the bush at Tower Hill, seven miles from Fingal. A report was received by Superintendent Propsting during the day that a lit belonging to Mr. J. S. Goodall, mining expert, of Launceston, and situated on Crown land at Tower Hill, had been discovered in smouldering ruins at 7 o'clock this morning. The hut was known to have contained bedding, men's clothing, tools, and provisions, but among the debris there remained no trace of these articles. Superintendent Propsting promptly formed a theory that the lire had been the work of an incendiarist, and that the motive was robbery, the fire being most probably started to cover up the theft and to divert suspicion. Having drawn his conclusions from a knowledge of the district and people, the superintendent at once despatched Trooper Shepherd, with some general hints as to the best action to take. A wire was also sent to Constable Hogan, at Mathinna, to join the other trooper on arrival at the scene of the fire. The marks of a man's boot prints were clearly discernible leading from the destroyed hut across the bush in the direction of Redburn's abode, which is in a secluded part of the forest. In over hauling the house the police found a large compass, a magnifying glass, a rug, and a coat, which are identifiable as Mr. Goodall's property. In reply to questions, Redburn stated that he had received these articles from a tramp last Friday. He denied any knowledge of the origin of the fire. He was arrested and handcuffed, and, a vehicle having been procured, he was conveyed to the Fingal gaol by Trooper Shepherd. Redburn will come before the Fingal court in the morning, and will probably be remanded. A carefully prepared and determined attempt to break out of gaol was made by a prisoner named Walter Redburn, under remand at the Fingal gaol, on Saturday, and the plan was only frustrated by the vigilance of the gaolkeeper, Constable Dore, whose suspicions were aroused by what to the uninitiated might have seemed but trifling circumstances. The gaol is a substantially built structure, containing a number of cells and a day room, equipped with a fireplace. Though the building is comparatively modern, the cell doors recall the penal days, for they are the massive structures with locks strengthened by bolts built by prison labour and used in the thirties. Leading between the double row of cells. a corridor opens on to an exercise yard, which is enclosed by a spike-capped fence some 12ft. in height. In the morning, Constable Dore removed Redburn front his cell into the day room, and made him a fire and gave him his breakfast, he was also permitted to wear his mackintosh overcoat. When his dinner was given him Redburn was wearing his overcoat. On going to the door with his meal the constable, whose avocation teaches him, like the red Indian on the warpath, to carefully observe even the smallest detail, he was of opinion that he had left the key, which was in the outside of the door, with the loop in a horizontal position at his last visit. he now found that t it was turned perpendicularly. Lest, however, he had been mistaken, he would not say anything to the prisoner, but determined to be sharply on the qui-vive. He noted the position in which he then left the key, and looked to all the fastenings of the outer doors, with especial care that the outside bolls were in position. He then had to leave the premises for other duty. On returning, without giving evidence of his pretence after patient waiting he heard sounds that told him a lock was being tampered with. He entered the gaol and again found that the key in the dayroom been shifted from the position in which he left it. In an attempt to open the door, he found a difficulty in turning the key. On opening the door he discovered that the staple into which the bolt of the lock went had been torn from its fastenings and had been temporarily placed back in position and wedged in its place with little pieces of coal. The rivets holding the ward of the lock itself had been scraped clear of the panel as if an attempt had been made to force them before the breaking of the staple had been found the less difficult method of getting out of the room. The prisoner had his boots on and his mackintosh had been folded into an extremely neat and compact roll and strapped with string, showing that lie was not a 'prentice hand at rolling a swag. Redburn denied that he had touched the lock. He was at once transferred to one of the double-locked cells. A further examination showed Constable Dore that his prisoner had actually been out of the dayroom and making his way stealthily along the corridor in his stockinged feet, and had made an attempt to open the door leading to the yard. He had taken out the screw and some nails, which for greater security held the staple of the lock in position, but his effort to open the door had been frustrated on account of the heavy bolt, which as further security was on the yard side. Apparently finding himself thus baffled, he had gone back to the dayroom and packed up the staple of that door with the pieces of coal, in the hope that his attempt would not be immediately noticed. He evidently forgot or had not time to unroll his mackcintosh. Mr. Ottoway, a local tradesman, was requisitioned to repair the damage. At the Fingal Police Court on Wednesday, before Messrs. F. E. Ransom (Warden), Walter Redburn, was charged with having broken into a hut belonging to John Senor Goodall, and stolen a compass, rug, coat, vest, blankets, shirts, and other articles, valued at £25, the property of John Goodall. Superintendent Propsting prosecuted. John Senor Goodall gave evidence to the effect that in November last he left his hut at Tower Hill to go to Launceston, and locked it up. On his return several articles were missing. He identified those produced as being his property. Joseph Cocker stated that he saw a fire in the direction of Goodall's hut at 7 o'clock on the morning of the 16th inst. He went there and found that it had been burnt down. He noticed tracks to and from the hut, leading some distance towards Fingal. Later on in the day he accompanied Trooper Shepherd, when he traced tracks to Redburn's hut. Frederick Cocker stated that the hut burnt down was left in his charge by John Goodall. He saw it last on Monday, 15th inst. It was then securely locked. He saw the rug produced on a bed inside. Everything else was undisturbed. He saw the remains of the fire on the morning of the 16th inst. There were boot tracks leading to and from the hut in the direction of Fingal. Accompanied by Trooper Shepherd, he traced the tracks to Redburn's hut. Redburn worked with him for Mr. Goodall prospecting. He (Cocker) paid, on behalf of Mr. Goodall, the wages to Redburn, who stated at the time that Goodall owed him more, and that he'd like to wring his neck. This occurred a few days before the fire. George Cocker stated that Redburn worked for him up to the time of the fire. He afterwards went with Redburn to his hut, and found the compass, rug, coat, and vest (produced), and other articles. Redburn stated that the compass had been given him by a man named Carlton. The rug and coat were left to him by a man on the Friday before at about 5 p.m. Superintendent Shepherd then arrested Redburn on a charge of housebreaking. Constable Hogan accompanied, and assisted in the investigation and arrest. Constable Hogan stated that, under instructions, he met Superintendent Shepherd at Tower Hill on the 10th inst., and went with him to where Goodall's hut had previously stood. He assisted in examining the debris, and traced footprints to and from Goodall's hut to Redburn's. Trooper Shepherd stated that he proceeded to Fred Cocker's, at Tower Hill, on the 16th. He afterwards examined the debris at Goodall's hut, and saw the remains of papers, mattress, and straw, but nothing indicating that clothing or blankets had been burnt. Footprints were visible. He traced them coming and returning in the direction of Redburn's hut. The tracks corresponded with those made by Redburn's boots. Constable Hogan corroborated Trooper Shepherd's evidence. Redburn was fully committed to take his trial at the Supreme Court, Launceston. The police of the surrounding districts have been informed of the escape, and will keep a sharp look-out for Redburn. Another case of gaol breaking occurred yesterday morning, when Walter Redburn, who was recently committed for trial at Fingal on a charge of breaking and entering a hut, effected his escape. When the warder made his last round at midnight on Tuesday every. thing was found to be correct, but at 0.45 yesterday morning, when the cells were again visited, the door of the apartment occupied by Redburn was found to be open. An examination disclosed that the jamb of the door had been removed with the aid of an old chisel, which was found lying in the cell. Redburn had also made a rope by tearing his blanket into strips, and scaled the western wall, over which he was able to reach Patterson-street. The improvised rope, however, was too short to allow the prisoner to lower himself on to the footpath of the street, and it is estimated that. he had a fall of from 18ft. to 20ft. Marks were plainly visible on the outside of the wall where he had come down. The warders do not think he could have got away before daylight, as the removal of the jamb of the door would take several hours to accomplish with a chisel. A warrant was issued for Redburn's arrest, together with the following description:--Age 30 years, height 5ft. Skin., weight 12st. 81b., of stout build, dark complexion, dark brown hair, hazel eyes. He has a small scar on the right shin, small scar on the left knee-cap, and also on the right cheek bone. Redburn, who made an attempt to break out of the police station at Fingal while awaiting his trial, is a blacksmith by trade, and a native of Evandale. 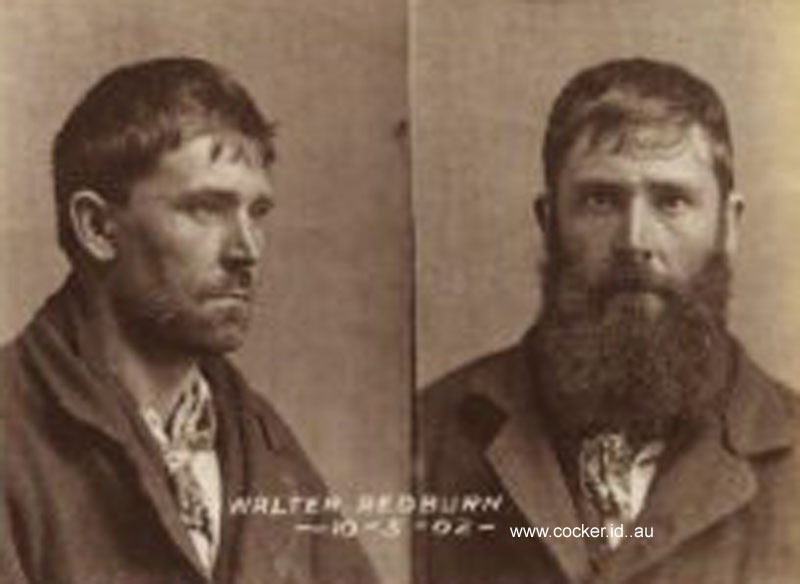 Superintendent Driscoll received a telegram on Saturday afternoon stating that the prisoner Walter Redburn, who escaped from the Launceston Gaol last week, was recaptured at 6 o'clock on Saturday morning at St. Aubyn, Ben Lomond. The arrest was effected by Troopers Shepherd, Gillam, Cole, and Special Constable Coghlan. In stating the case for the Crown, the Solicitor-General said that the accused was charged with breaking into a hut occupied by a Mr. James Goodall on June 15, and taking away a lot of goods of a miscellaneous character. On the morning of the date mentioned the hut was found to be burnt down. Footprints were found leading from the hut, which tallied with those of the accused. It was evident that the accused bad broken into the place and stolen the goods, and in order to conceal the crime he had set fire to the place. The prisoner might have been charged with arson if it had been deemed advisable. All the articles missing from the hut were found in the possession of the accused, who stated that he had obtained them from a tramp. Evidence would be given, however, that such story was a pure fabrication. The learned prosecutor pointed out that unless a person could satisfactorily account for being in possession of stolen goods, it was only reasonable to surmise that he had come by them dishonestly. The first witness was James Simeon Goodall, who stated he was a mining prospector, and sometimes resided at a hut at Tower Hill. "Was it your hut?" enquired Mr. Dobbie. "No," was the reply. "I found it unoccupied, and took possession of it." The witness detailed the articles that were in the hut, which he had locked up previous to his leaving for Launceston. The list of goods stolen comprised clothes, a wire mattress, and a portmanteau containing valuable papers. Mr. Clarke interjected---"Mining reports, I suppose." The witness went on to say that there were also boots, tools, crockery, compasses, bedding, and other sundry articles in the hut, which had been left in charge of a man named Frederick Cocker. The goods recovered from the accused were produced in court, and they were a miscellaneous lot. The witness positively identified all the articles as being his own property. Mulch amusement was created in court by the comments made by the witness as he handled each article separately. "What about those tins of sardines?" asked the Solicitor-General. "Yes. I believe they are mine," replied the witness, who continued, "the brand is the same, and they were not bad eating." Mr. Dobbie remarked that he hoped the witness did not get bilious through eating so many sardines." A little tin box or candlestick was shown to the witness who said that it was his own property, He also remarked that he often read in bed at night, and used the candlestick on such occasions. His Honor remarked that it was a dangerous practice to read in bed. "A man has often to do dangerous things," said the witness. Mr. Clarke then took the witness in hand, and proceeded to examine him with regard to his possession of the hut and his identification of the articles. The Solicitor-General intimated that he would abandon the charge of burglary against the accused, as it seemed that the evidence was too shadowy. His Honor approved of such course of action, and said that the prisoner would be charged with larceny and receiving. In consequence of the witness being somewhat deaf, learned counsel had to speak in very loud tones of. voice. "I am afraid I cannot go on like this," said Mr. Clarke, "because I shall soon be pumped out." Counsel left his place at the barristers' table and took up his stand alongside of the witness box. "Now, how did Mir. Cocker get into the hut when you took the key away with you to Launceston?" asked counsel, who continued, "Is it not a fact that the gentleman got into the hut through the slabs on the roof?" The witness replied that he did not enter in that manner, as he got in through the chimney. Counsel proceeded with his examination of the witness as to the identification of the articles alleged to have been stolen. The replies of the witness afforded much amusement to the spectators in court. "How do you identify that blanket?" asked Mr. Clarke. "By a mark of candle grease," was the reply. "Do you usually mark your clothing and other articles with drops of candle grease?" enquired counsel. "It would take a pound or two of Indian ink to mark everything I had," replied the witness amid laughter. "Oh, indeed," said Mir. Clarke. "Yes, indeed," remarked the witness, "but you have a lot to learn yet, Mr. Clarke." All the articles were safe in the hut when he left it in February. Evidence was given by James Cocker that on June 1i he went out to the hut and found that it had been burnt down. There were tracks leading to the hut, which were measured by the trooper and himself. Redburn's hut was about half a mile from Mr. Goodall's hut. Cross. examined by Mr. Clarke, this witness said that he saw a fire at the hut between 7and 8 o'clock the morning of June 10, and that was what caused him to go out to see what was the matter. He had seen the hut intact a few days previously. Frederick Cocker who was entrusted with looking after the hut by Mr. Goodall, stated that the place, was all right on the previous day to that on which it was burnt down. He then saw through the window a lot of the things produced in court. It was three weeks before the but was burnt down that he was actually inside the place, and he then saw the clothing, subsequently found in the possession of the accused, hanging on the walls. In the witness's opinion it would have taken about two hours to burn down the hut, as the bark of which it was composed was very dry. He noticed tracks leading from the hut, which he followed for about 100 yards, as far as a fence. "Now, as a matter of fact," asked counsel, " did the footprints lead to the prisoner's hut?" The witness hesitated somewhat. "Come, now," said Mr. Dobbie, "you must know where the tracks led" After a brief pause the witness replied that the footprints went in the direction of Redurn's hut. In answer to his Honor the witness said that he was inside the hut about three weeks before the fire. "How did you get into the hut? asked Mr. Clarke. "By taking off a slab at the end." replied the witness, who went on to say that ie was only placed in charge of the hut on April 16. '"Then, if Mr. Goodall says that you were in charge in November of last year it would be incorrect?” enquired learned counsel. "Yes, it would," was the reply. The accused had been working for Mr. Goodall and a sum of £6 was due to him. Witness received £10 from Mr. Goodall. and paid the prisoner £3, retaining £7 for himself: "Did Redburn say anything when you handed him £31" asked counsel. "Yes, he said that he would like to wring Goodall's neck." Mr. Clarke wanted to know whether it was not a fact that it was the witness's neck that the accused expressed a desire to wring. Evidence was given to the effect that the accused had been working at the mining claim, and that he was engaged up to the night of June 15. Trooper Shepherd, stationed at Fingal, stated that he followed the tracks alluded to by previous witness, and traced them to the accused's hut. The witness measured the footprints, and found that they tallied exactly with the measurements of the prisoner's boots. He also went to the burnt hut and asked the accused if he had any property in his possession that was not his own. The prisoner replied that he had a ring and a coat which a tramp had left at his hut, but in reply to questions he said that he would not know the tramp again if he saw him. Witness searched the premises, and also the accused, and found the articles produced in court. Constable Hogan corroborated the evidence of this witness. George Carlton, a mining surveyor, was called to prove that he had never given to the accused the compass found in his possession. The 'prisoner was working for the Tower Hill Prospecting Association. It was possible that lie might have given the accused a compass, but certainly not the one produced in court. This' closed the case for the Crown, but Joseph Cocker, who was recalled, stated that his wife had bought for the accused a dish similar to the one produced. Mr. E. If. Law addressed the jury for the defence. He said that in listening to such evidence as had been brought forward by the Crown the jury would have to exercise great discrimination and care. The very Effect of being arrested caused ignorant persons to make extraordinary statements. He hoped that the jury would not be prejudiced by the appearance of the accused in the 'dock, who, because he had committed a breach of prison regulations, was brought before the court in prison garb. Witnesses called by the Crown proved that the statements made by Mr. Goodall were incorrect, in that they stated the hut had been visited a few days before the articles were stolen, whereas it had been shown that it was nearly three weeks prior to the 'but being burned down that any authorised person went inside. It had also been shown that the but was very lightly built, and that there were openings between the slabs which enabled any passerby to see what was inside. With regard to the tracks no dependence could be placed upon the evidence tendered by the trooper. It was just as reasonable to assume that the tracks were made some time after the hut was burnt down. The conduct of the accused, when he was visited by the police was not that of a guilty man. Learned counsel concluded an eloquent address by appealing to the jury not to rely upon the evidence brought forward by the Crown, as it was purely circumstantial. His Honor traversed the evidence, and asked the jury to say whether the story told by the accused as to how he came into possession of the goods was correct or false. It seemed to him that the explanation made by the prisoner was a very lame and weak one. The jury, after a brief retirement. returned into court with a verdict of guilty against the accused of larceny. Mr. Clarke pointed out that the prisoner was a married man with four children, the eldest of whom was four years of age. His Honor said that he would require time to consider the term of punishment to be awarded, and accordingly remanded the prisoner for sentence. Walter Redburn, who had been convicted of larceny, was placed at the bar. In answer to the usual question, he said he had no statement to make. His Honor said that there was, no doubt about the prisoner's guilt, as the case had been proved up to the hilt. An appeal had been made by his counsel in mitigation of the sentence because he had a wife and three children to support, but he had no direct evidence on that point. His Honor, however, had been informed that the prisoner did not support his wife or family. In these cases, the innocent always suffered as well as the guilty. The jury could not have returned any other verdict than they had done. Unfortunately, the prisoner had a gaol record, he having served a sentence of 12 months for horse-stealing. He would be imprisoned for three years.